Clinical quality improvement beyond benchmarks. The Office of Inspector General fraud alert on medical directorships provides a reminder of the importance of compliance. 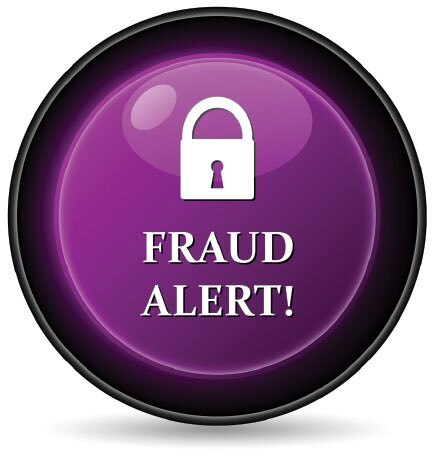 On June 9, 2015, the Department of Health and Human Services Office of Inspector General (OIG) published a fraud alert related to physician compensation arrangements. Of relevance to physical therapy, the alert discusses medical directorships and compliance with the antikickback statute. The alert reminds the provider community and others that even if one purpose of a medical director arrangement is to compensate a physician for his or her past or future referrals of federal health care program business, the antikickback statute may be violated. Although the OIG and other governmental agencies have provided extensive guidance on physician compensation arrangements in the past, this alert serves as a reminder of the importance of compliance and provides a good opportunity to review certain federal regulatory issues associated with physician compensation arrangements. This article will provide a high-level overview of federal laws that must be considered in physician compensation arrangements and review some practical steps that can be taken to assist in achieving compliance in this area. The primary federal statutes applicable to medical director agreements in this context are the antikickback statute and the Stark or Physician Self-Referral Law. In general, the antikickback statute prohibits offering, paying, soliciting, or receiving anything of value to induce or reward referrals or generate federal health care program business. The antikickback statute is intent based, which means that if even one purpose or intent of the arrangement is to compensate a physician for referrals, that may be sufficient for an antikickback violation. Violation of the antikickback statute can lead to substantial criminal, civil, and administrative penalties. The antikickback statute does include voluntary safe harbors, which describe a payment and business practice that is not deemed an offense under the statute. The antikickback safe harbor covering personal services and management contracts is implicated in the medical director context and is discussed in further detail here. The Stark or Physician Self-Referral Law prohibits a physician from referring Medicare patients for designated health services, which are defined to include physical therapy, to an entity with which the physician has a financial relationship unless an exception applies. Additionally, the Stark Law prohibits the provider of a designated health service from submitting a claim to Medicare for those services resulting from a prohibited referral. Unlike the antikickback statute, which has an intent component, there is no intent standard when analyzing whether a Stark violation has occurred. A violation of the Stark Law subjects the relevant party or parties to civil penalties including a refund of the overpayment, false claims act liabilities, and civil money penalties. The Stark Law, similar to the antikickback statute, provides for exceptions that allow a legitimate business arrangement to move forward without violating Stark so long as the safe harbor requirements of the exception are satisfied. However, in contrast to the antikickback statute and its voluntary safe harbors, an arrangement that would otherwise violate Stark must fit an exception to the law. Prior to expressing its concerns in the fraud alert, the OIG has taken action against numerous providers in recent years for violating the antikickback and Stark Laws relative to medical director arrangements. These actions are based on a variety of underlying violations including financial arrangements that take into account the value and volume of referrals made between the parties, paying other than fair market value for the services provided, paying for services not performed, paying for services performed pursuant to agreements that either had expired or were not in writing, payments made at rates different than those set forth in the contract, and payments for services that were not as described in the contract. The aggregate services contracted for do not exceed those that are reasonably necessary to accomplish the business purpose of the services. Before retaining a medical director, the practice should assess the actual need for a medical director. In some instances, the practice may be required to have a medical director for regulatory or compliance purposes. While specific needs should be identified, by way of example a medical director may be retained to provide services such as consulting with the practice regarding treatment procedures and protocols, assisting with quality assurance issues, providing appropriate in-services for staff, and meeting regulatory requirements. As discussed earlier, the payments under a medical director agreement must be fair market value. The parties should perform appropriate due diligence to determine fair market value and should maintain this supporting information. Supporting documentation may come through objective data such as published salary surveys and may consider the nature of the services provided, the geographic location, and other factors. The fees paid to a medical director cannot be based on the volume or value of referrals received from the medical director. In connection with the determination of compensation, the parties should also determine, and include in the written agreement, the amount of time the medical director will be performing services. The specific duties and responsibilities of the medical director should be included in the written agreement. Prior to compensating the medical director, the parties should establish a mechanism to support the specific services provided during the relevant time period. This is often done through submission of a timesheet describing the services performed. This document is generally then subject to approval by the provider and is retained by the parties for their records to support the payments made. In addition to the antikickback and Stark Law requirements, any other applicable federal or state laws that may affect the medical director relationship should be considered. 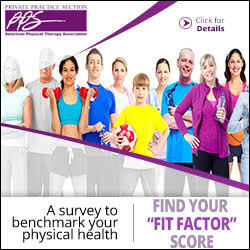 In summary, many physical therapy practices choose to retain the services of a medical director for a variety of legitimate business purposes. In doing so, one issue to consider is assuring that the arrangement is compliant with the federal Stark and antikickback statutes. 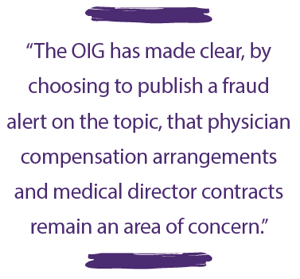 The OIG has made clear, by choosing to publish a fraud alert on the topic, that physician compensation arrangements and medical director contracts remain an area of concern. Paul Welk, PT, JD, is a Private Practice Section member and an attorney with Tucker Arensberg, P.C. He can be reached at pwelk@tuckerlaw.com. This statement above could certainly be the mantra of anyone working in the health care industry. As we approach our annual conference, the Marketing and Public Relations (PR) Committee is looking forward to learning more about the changes that will affect private practice physical therapy and we will also be making a change in our committee chair. As chair for the past 4 years, I have had the privilege of working with an outstanding group of individuals who have volunteered many hours to provide members with marketing and PR tools, build a media corp, and further the message to the general public that private practice physical therapy, is the best first choice. The committee is excited to further provide both educational opportunities and deliverables needed by our members in order to achieve success in their marketing and PR programs. As Michelle Collie, PT, DPT, MS, OCS, takes the reins of the committee, she has both of these goals in mind. It is believed that each generation has common traits that give it a specific character. The term “Millennials” refers to the generation born roughly between 1982 and 2004. This generation often demonstrates “pragmatic idealism,” a deep desire to make the world a better place combined with an understanding that doing so requires building new institutions while working inside and outside existing institutions. In her 2015 article for Harvard Business Review, Karie Willyerd states that the young people in our offices crave—and respond to—a good, positive coach, who can make all the difference in their success. In a global survey conducted by Success Factors in 2014, 1,400 Millennials stated that they wanted more feedback from their managers. Most wanted monthly feedback, whereas non-Millennials are comfortable with feedback less often. 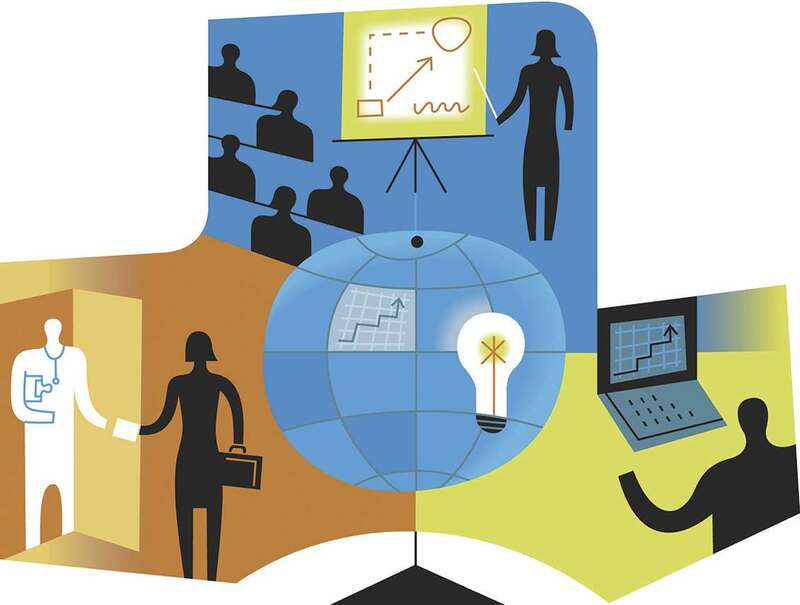 Overall, Millennials want feedback 50 percent more often than other employees, and while they stated that their number one source of development is their manager, only 46 percent agreed that their managers delivered on their expectations for feedback.